NEW YORK - Baylor, Notre Dame, Mississippi State and Louisville are the No. 1 seeds in the women's NCAA Tournament, leading a March Madness field that was revealed early thanks to a production error. Walz won't coach the Cardinals’ opening game against Robert Morris as he will be serving a one-game suspension for using profane language toward NCAA officials during the Final Four last year. 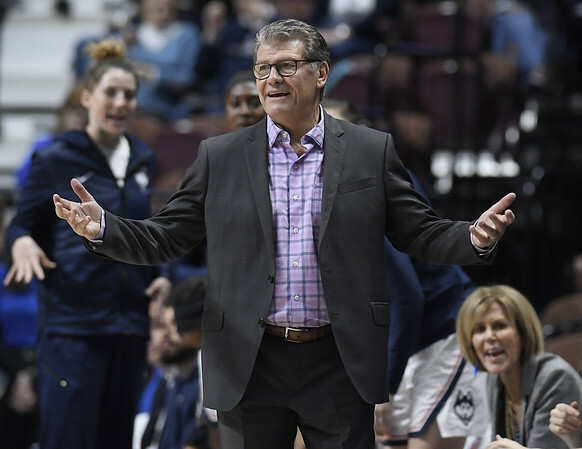 The veteran coach said he expects to have the support of the UConn fans if his team reaches the Sweet 16 and plays in upstate New York. Maryland is the No. 3 seed in Albany and Oregon State is the 4. “If we're fortunate to get that far I'm confident that half of the UConn fans will be wearing Louisville gear and they won't know who to cheer for,” Walz said, laughing. Posted in Newington Town Crier, UConn on Monday, 18 March 2019 20:03. Updated: Monday, 18 March 2019 20:05.